Kota Kinabalu, 20 September 2018 – The state action plans to conserve the Sunda clouded leopard, proboscis monkey and Bornean banteng is on the final lap towards implementation pending approval from the Sabah State Government. Sabah Wildlife Department (SWD) Director Augustine Tuuga said that following the soft launch of the state action plans today by Deputy Chief Minister and Minister of Tourism, Culture and Environment, YB Christina Liew, a cabinet paper will be prepared and tabled at the next State Assembly in early November. “We hope that the plans will be approved by the Cabinet and that the Chief Minister will officially launch them before the end of the year, his support of these plans will give a boost to the conservation of these three endangered species” he added. The SWD, with the assistance of Danau Girang Field Centre (DGFC), produced the 10-year action plans for the Sunda clouded leopard, the proboscis monkey and the Bornean banteng, following several years of gathering biological and ecological information on the three totally protected species in Sabah. The efforts, which were supported by Yayasan Sime Darby (YSD) since April 2011 with a total commitment of RM3.96 million, included consultation workshops and international conferences with various stakeholders ranging from governmental departments, subject matter experts and industry leaders. The recommendations proposed at the conferences underpin the state action plans. DGFC Director and Reader at Cardiff University Dr Benoit Goossens said the three species are threatened by habitat loss and fragmentation, poaching, and road development such as the proposed Pan Borneo Highway. “The decline in proboscis monkey populations is directly attributed to the expansion of aquaculture projects in mangrove areas (such as the shrimp farming project in Pitas) and the conversion of riparian habitats to agriculture land and human settlements,” he said. “Sunda clouded leopards suffer mostly of low population density while the Bornean banteng decline is due to heavy poaching, snaring and fragmentation. The banteng population is split in four regional management units that are totally isolated from each other,” he added. Goossens stressed that one of the most important actions for the three species is the increase of enforcement on the ground with the establishment of Spatial Monitoring and Reporting Tool (SMART) patrols across their ranges. “But more specifically, for the Bornean banteng (with a minimum population size of about 300 individuals), the setting up of a captive breeding programme is imperative,” he said. “Moreover, any area with the presence of bantengs must be managed sustainably by developing and maintaining pastures within and near the home ranges of the existing herds,” he added. 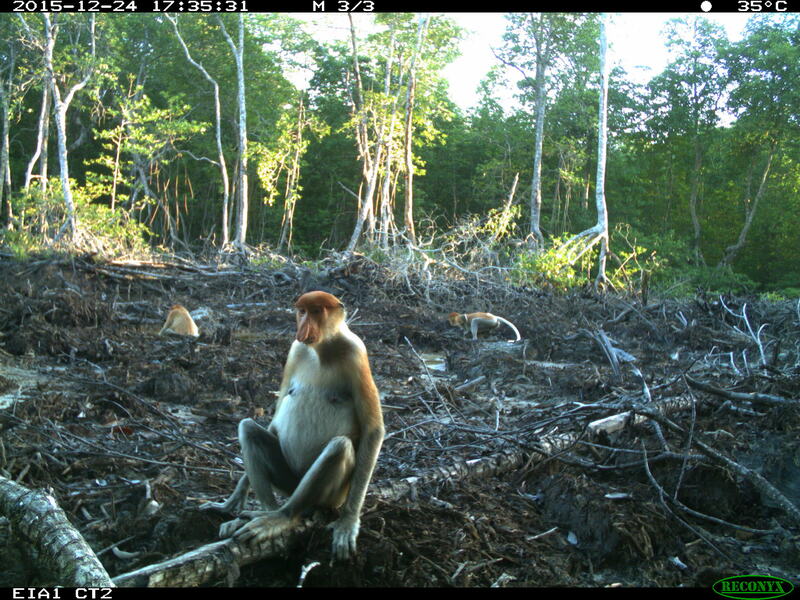 Goossens said as for the proboscis monkey, increasing suitable mangrove and riparian forest areas as well as habitat connectivity between their different habitat ranges are crucial for their survival. “Finally, for the Sunda clouded leopard, with an approximate population size of 750 individuals, it is imperative to halt the loss and degradation of their habitat and maintain landscape connectivity. The proposed Pan Borneo Highway could have a detrimental effect on the Sunda clouded leopard by increasing fragmentation and the number of road kills,” he added. Goossens said DGFC also recommends that an Endangered Species Conservation Unit be set up to monitor the implementation of the three state action plans as well as any other plans for Schedule 1 terrestrial species. YSD Governing Council Member Caroline Christine Russell said the Foundation is proud of the efforts of DGFC and the SWD towards successfully completing the state action plans to conserve three endemic and vulnerable species in Sabah. “We have invested close to RM4 million in these projects over the years. Now, YSD hopes that the Sabah state government will adopt and implement these action plans as part of the State Environmental Conservation Policy, timely and effectively, towards the conservation of these 3 species,” she said. “We also hope that the soft launch of the state action plans will serve as a catalyst for other organisations to come in and be part of these important efforts to conserve the proboscis monkey, Sunda clouded leopard and the Bornean banteng,” she added.